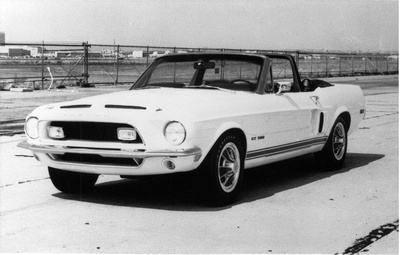 With Shelby American unable to pull out of the tail-spin that started upon the launch of the '67 model year production, Ford soon made the decision to postpone Shelby's planned mid-year convertible. 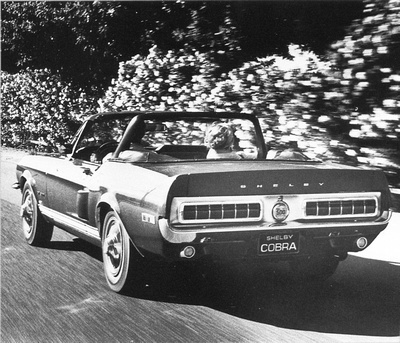 Instead of introducing the convertible as a 1967 ½ model, it would be postponed six months and offered as a '68. This gave Ford the extra time needed to fully address the flaws introduced by Shelby's design of the '67-styled fiberglass components. 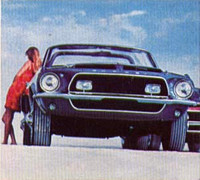 Circa February, 1967, Ford provided their updated design to A.O. Smith and tasked them with fabricating the new fiberglass components to modify (disguise) two 1967 model year G.T.s for "Photographic Purposes" a/k/a "Advertising Cars." 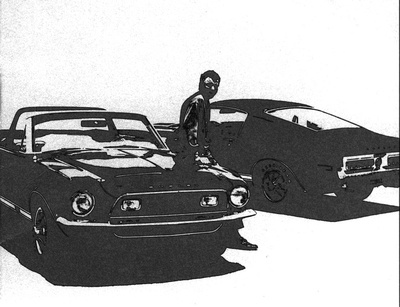 One was to be a fastback and one a convertible. 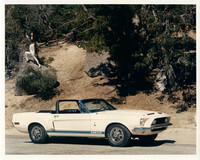 Once these cars were updated, with what we now identify as "1968 Shelby styling," the cars were taken to multiple southern California locations and extensively photographed for future advertisements and dealer marketing materials. Based on scenery, people and subtle differences to cars, we've organized the photos by location. All photos appear to have been taken between April 1967 and August 1967. Click on any of the photos below to see photos from a specific location, or visit the vintage photo index to view them all. This is the only shoot where the convertible is found wearing '67-style 10-spoke wheels. 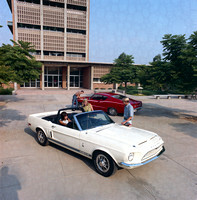 Convertible is wearing Ford Turbine wheel covers, and Fastback wearing the '68 Shelby wheel covers. 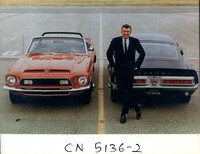 The Los Angeles Airport Facility photos are the only photos where Carroll Shelby is posing with the cars. Likely the first photos taken after being repainted white. 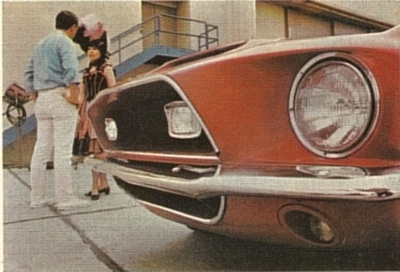 The brunette model also appeared in the 1967 model year advertising photos taken at Hollywood Park. Location Unknown. Riverside International Raceway? The license plate does not appear to be a California plate. 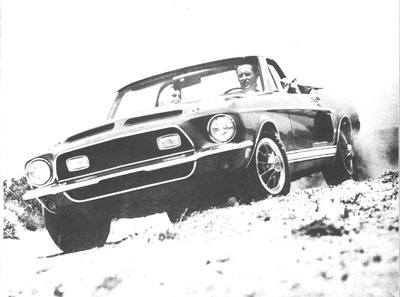 This photo appeared in the September 1967 Motor Age magazine with credit to Pete Biro. One photo also had "157-9812-SHEL-5" written on the back. Unknown Location - Might be same location as '68 Step Lively postcard mailer. Unsure if 0139 or a different car. It was through careful scrutiny of the vintage pictures that we were able to discover the many telltale signs that the cars in the photographs were actually '67 model year cars with '68 styling features. Because there was only one 1967 Shelby G.T. 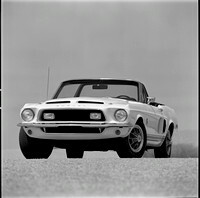 convertible itemized on the Shelby American company car ledgers, we know this to be our car (SN:0139/INV:062). Pay close attention to the gas cap, antenna, wheels, tail pipe extensions, vent windows, rear view mirror, instrument cluster, radio, emblems, rocker stripes, lack of chrome rocker moldings, front bumper extension cutouts, one-piece fiberglass front nose-cone, quarter panel reflectors, roll bar clasps, blacked-out pedestals supporting the 658 'spot-beam' Marchal lights, center emblems on hubcaps, and hood lock cables. Constructing a timeline allowed us to conclude that the fender-side emblems, rocker strips, and fuel filler cap were the last items to be finalized during the evolution of the '68 styling process. In fact, you can see that most of the photos that appeared in print ads and dealer literature were retouched (airbrushed). We also discovered that the left (A) side and right (B) side of the car had completely different emblem/stripe treatments during the initial iteration of this process. The key indicators that allowed us to sequence the photographs include: the paint color, quarter panel reflectors (decals evolving to actual reflectors), hood locks (click pins evolving to Dzus twist-locks with cables) and the roll-bar (with and then without metal clasps on top). In a number of 'in motion' photographs, including those taken at the San Jacinto Mountains and on the tarmac at Shelby's LAX facility, you will notice a man with a smile behind the wheel of the convertible. Our suspicion, based on that smile, was that the driver wasn't a professional model, but rather a Shelby American employee. Turns out we were right -- the man behind the wheel was Gary Pike, and his grin clearly indicates he was enjoying his job. Gary worked at Shelby American along with his brother Don and his father Leroy.